This week Governor Snyder signed legislation that he has championed as a “Marshall Plan for Talent.” It’s not a precise metaphor — the original Marshall Plan was the post-World War II effort by the United States to fund the economic redevelopment of the war-torn Western Europe to help rebuild an entire society. For our version the State of Michigan will spend $100 million in education initiatives, training, and scholarships to help rebuild our pool of skilled trades talent. So, different scale and stakes, but similar concept. At its core, the plan is really about education reform. It’s an attempt to help correct a bias to nudge all students toward four-year college degrees when a two-year degree or trade school training would better serve those who prefer hands-on work. The hope is to allow students to prepare themselves for careers that match their interests and talents. Former “Dirty Jobs” host and trades advocate Mike Rowe refers to this as “Work Hard AND Smart” (as opposed to the advice of “Work Smart, not Hard” that he received when he was in high school). But mostly the plan was approved for its potential economic return on value. 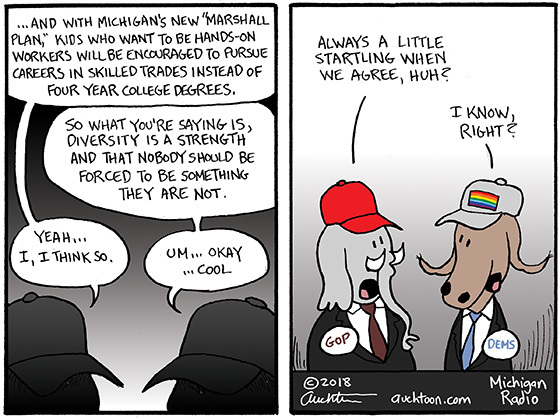 Michigan identifies as a place where stuff is made. To support that notion, we need people with the skills and talent to actually make stuff. So if we encourage and assist the people who enjoy working with their hands to pursue a career doing just that, they will fill the open positions and grow our manufacturing sector. Assuming, of course, a trade war doesn’t kill it off. Remember When Michigan Was Great? I have something of a Wikipedia problem. In idle moments in between tasks, I tend to wander over to the website for a quick nip — the plotline of a half watched movie here, the defining geographic features of an obscure African country there. I’m in, I’m out, and I’m back to the task at hand. No big deal. I can quit at any time. Really. The second is: “We should be able to learn from history, but we don’t.” There we were in 2016, living an economic expansion after having survived the Great Recession. Sure, it wasn’t what we wanted it to be, but times were relatively good. But again, we now seem to be letting our greed and prejudice and tribalism get the best of us. You all just experienced the same week I did, so no need to relive it here. Let’s just maybe resolve to remember the positives of the past without repeating the mistakes. 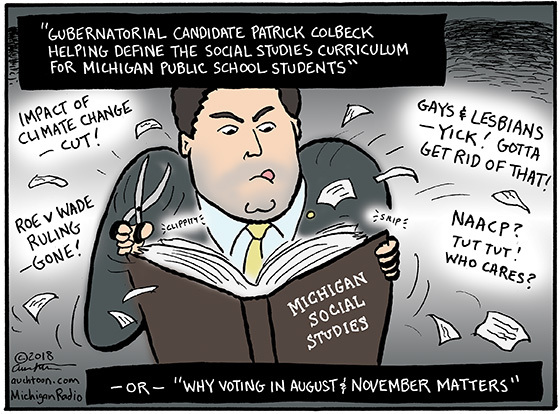 Michigan state Senator and gubernatorial candidate Patrick Colbeck has been involved in recent efforts to update the social studies curriculum for K–12 public schools. Colbeck’s stated goals are to “remove partisanship from the classroom” and move students towards a more “politically neutral” dialogue that offers a balanced view of historical issues. Perhaps he is sincere, but few promulgate a more politically non-neutral agenda than Patrick Colbeck. Bridge Magazine has a very thorough article about this and one of its authors, Lindsay VanHulle, discussed it on Michigan Radio’s Stateside earlier this week. One of the more revealing examples of Colbeck’s ambitions is his assertion that the term “democratic” implies partisan leanings. As a result, 13 references to “core democratic values” have been deleted or changed to “core values.” Politicians defining word usage for all has “dystopian” written all over it. More chilling, Colbeck confided that he only got about a 10th of what he wanted. Trapper: Frank! What are you doing? Hawkeye: Oh. Any special reason, Dr. Hitler? Frank Burns: One of the greatest living Americans is coming and I’m not going to let him see some of the trash that’s read around here. Trapper: Plato’s Republic? The Life of Red Grange? Hawkeye: Everybody runs around half naked. Frank Burns: It’s got *that word* in it. Hawkeye: Frank, you burn one more book, I’m gonna give you a dancing lesson in the mine field. Can we at least agree that the last person we want our next governor to emulate is Frank Burns? It happens more or less on a regular basis. Somebody with too much time on their hands will point to the large Middle Eastern and Muslim communities in Southeast Michigan and declare their suspicions of nefarious activity. They typically have no real understanding of the nuances — some are Muslim and some are not, some are Arab and some are not, some have been citizens for generations and some have not. But the numbers get lumped together to make the fear more plausible. Look, I do understand the possibility of danger — every group of people has potentially bad elements. 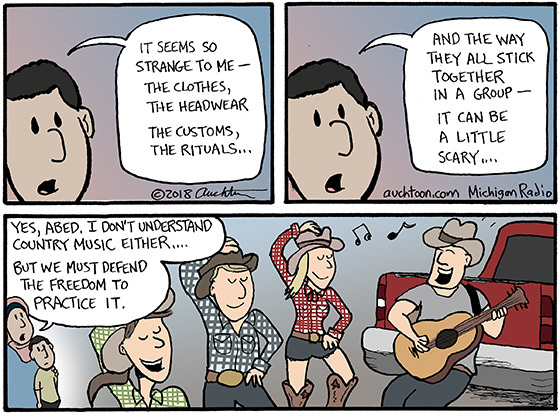 (As a middle-aged white guy from Michigan, I bear the burden of never knowing what stupid thing Ted Nugent is going to do next.) But I also understand the greater harm of disparaging an entire community. Or more to the point, the overwhelming benefits the people of these communities provide Michigan. 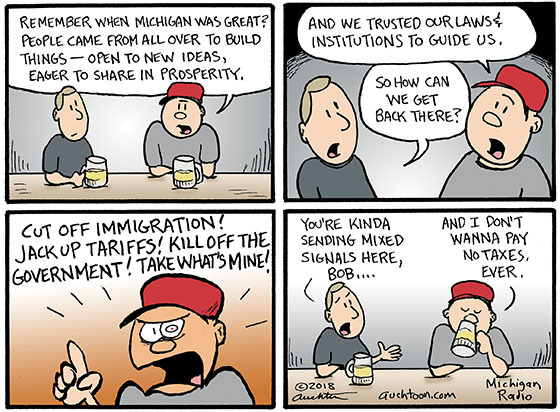 We can get so caught up with on on-going issues here in Michigan (roads, water, schools, etc.) that it’s easy to forget some of the reasons we have for taking pride in our state. Recently we marked the 172nd anniversary of Michigan becoming the first English-speaking government to abolish the death penalty. Even more impressive, we have not changed our minds about this since. Sure, there have been periodic efforts to legalize capital punishment in some shape or form. But to our credit, Michigan has resisted the emotional appeal and stayed the course. 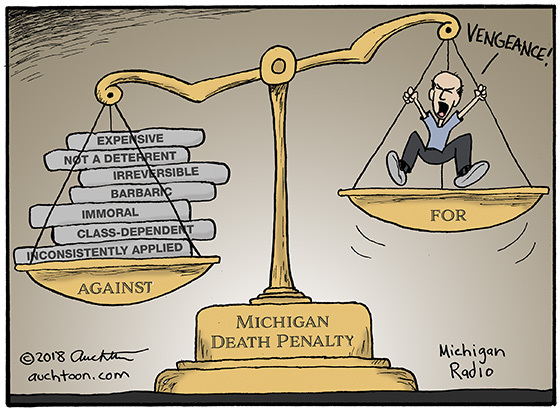 As the cartoon illustrates, there are many practical and moral reasons to be against capital punishment. While reasons to be for it are largely emotional. But it comes down to this: How can we write the laws so they are air-tight? How can we apply them evenly? How exactly would the convicted be executed? How much would it all cost? And how can we be absolutely sure? It says something positive about our state and ourselves that we have decided to go with reason over emotions. Because at any given moment we all can feel very pro-capital punishment for, say, slow drivers in the passing lane.